QED, the matter is simple. Does the moon ignore the gravitational influence of the sun while it orbits the earth? If not, then we can't treat the Sun-Earth-Moon system as two two body problems. Nor can we treat it as a single two body problem by considering the earth and moon as one and using the earth-moon center of mass as the second anchorpoint. That simplification also assumes that the moon cannot feel the gravitational pull from a body in the system. These are all cheats that work around a non-working system. The moon has mass and it must simultaneously feel the gravitational pull of the sun and the earth. It can't be simplified. We are at an impasse. I am expecting experimental evidence from the three body research, where such configurations should surely have manifested in the super computer simulations that have been done, and you keep telling us that cheats and two body approximations are enough. Surely there should be an example of a three body solution with bodies of different masses, or one that looks like a heliocentric system. Yet all the ones we have seen in the galleries (which are numerical solutions, not anlytical solutions -- those don't exist) require at least two bodies of equal masses, and exist in odd loopy orbits. Other similations employ the two-body cheats. There must be a simulation of gravity somewhere which operates in favor of heliocentricism. The scientific method demands that we demonstrate by experiment, and you appear to be ignoring all experimental evidence, are telling us that it is unneeded, and are repeatedly telling us that we can just cheat a little with two-body approximations, apparently cognisant that it won't work any other way. That is, in my opinion, not enough. We should either seek experimental evidence from a full gravity simulation where these approximations should manifest naturally or admit that doesn't work. If it can't work then it can't work. Sorry, he used 4, there's one on the camera too. And here's that Bobby experiment with no water tubes, if you like that method better. The error in perspective, which is almost universally committed, consists in causing lines dissimilarly distant from the eye-line to converge to one and the same vanishing point. Whereas it is demonstrable that lines most distant from an eye-line must of necessity converge less rapidly, and must be carried further over the eye-line before they meet it at the angle one minute, which constitutes the vanishing point. The theory which affirms that all parallel lines converge to one and the same point on the eye-line, is an error. It is true only of lines equi-distant from the eye-line; lines more or less apart meet the eye-line at different distances, and the point at which they meet is that only where each forms the angle of one minute of a degree, or such other angular measure as may be decided upon as the vanishing point. This is the true law of perspective as shown by nature herself; any idea to the contrary is fallacious, and will deceive whoever may hold and apply it to practice. Notice that some of the line overlays seem forced in Bobby's picture. They don't all point to the same place, but slightly different places. Also possibly related to the water leveling issues. The matter has already been impeached. The inability to calibrate the three chamber version of the device is direct evidence that the water is not level. Last year a caged water device was built by a member of our forums, which showed that the alignment of the liquid in the device is susceptible to error. It was seen that the liquid did not align and that water did not find its level. The water levels did not line up to each other in relation to the plumb line. The burden to show these devices as valid is absolutely on those who champion it. A small error in the foreground can cause a very large error many miles away. Again, if you are championing these devices then it is your responsibility to show that they are accurate. Ignoring direct evidence is not acceptable. Surveying is not an accurate science by its very nature. The idea that someone can create surveying tools without the need to calibrate it or test it for accuracy is quite rediculous. Are you a surveyor? Do you know better than the surveyors who tell us that surveying is always in error? 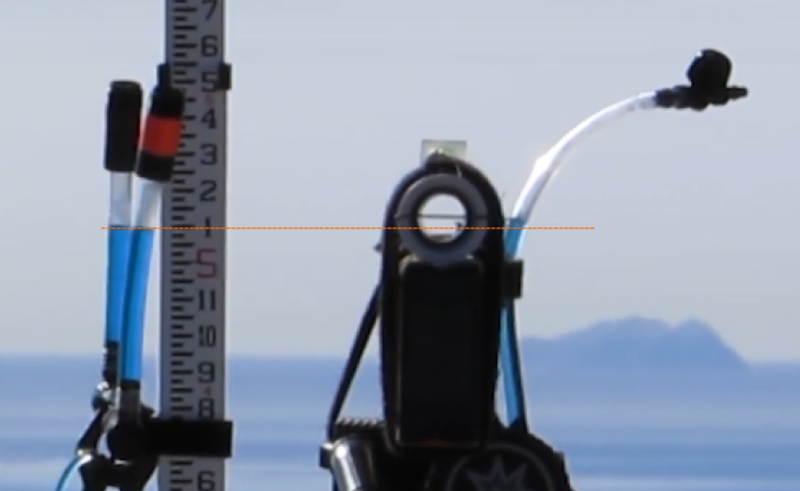 Are we to believe that amateurs created superior surveying equipment that can accurately test the horizon, the furthest thing that can be tested in surveying? No, that is absurd. Once again, the burden is entirely on those who champion the device to demonstrate its validity. You read that blog post and left thinking "this is a full simulation of gravity" and I am just cherry picking quotes and phrases to deceive people? If recollection serves, flat earth theory is older than globe earth theory, same for geocentrism. So I don't know what you're getting at. I can't think of many Flat Earth astronomers who have studied the planets. I can think of many RE astronomers. One would think that RE would have a working model by now, with all of science behind that effort. And one would think that FE would at least know where the planets are and how they move by now, with even a smidge of science behind that effort. But alas, nothing after thousands of years. It is pretty disturbing that you guys are still using ancient pattern-based methods of locating the planets rather than an RET model, and walk around under the fantasy that you have a working model. Three Body Problem solutions were not posted in this thread. I don't think I will bother to look at those posts. When you can find an example of a Three Body Problem that has bodies of different masses, that doesn't ignore physics, and has something that looks like a sun with a planet that has a moon, you should probably post a new thread about that. Science has been searching for a way to get Copernicus' heliocentric system working for a long time! As been shown time and time again, we got that. Unfortunately all of the water levels in Bobby's experiment were not level. This viewer suggested that a control was needed verify that all sighting devices were level and in-line. Since they did not match up, they must not be. Why should I care about planetary properties as a topic of research? How many people have been studying and making theories about the planets in the lifespan of FET vs 2000+ years of RET? Despite all the effort, it appears that the greatest minds of humanity have yet to come up with a model where a sun can exist with a planet that has a moon. The video you posted isn't the same experiment at all. Where do they attempt to align the water levels with something in the distance? Bobby's water levels did not line up. According to your hypothesis they should line up. Therefore the hypothesis or application is incorrect. This experiment has not been proven to be valid or accurate, or have any bearing on anything at all. It is not used in surveying or for any purpose. The principles need to be demonstrated. Yes, it does take only one experiment to discredit the device. The third chamber acted as a control. Which means that all other experiments of that nature were uncontrolled. What accuracy? The device needs to be able to be calibrated before one can say how accurate or close the method is. The device and underlying theory may be totally off in application. It's making a lot of assumptions about perspective, water tension, refraction, etc. The fact that it can't be calibrated shows the issue. We need a way to gauge how accurate it is. See bolded. They admit that the methods used are not correct. I believe that these are the same work-around methods QED considers to have solved the n-body problems. While in common use, it is my opinion that the commonality does not have anything to do with a correct depiction or simulation of Newtonian gravity. Everyone on here who has ever seen you post knows that if these experiments showed a horizon at eye level you would accept them unquestioningly. Only because this result does not match your confirmation bias are you flailing around trying to dispute the result - a result which confirms several other methods which people on here have shown and give the same result. But I look forward to seeing the results of your calibrated and controlled experiments. A version of the experiment was already performed with a third calibration chamber. The device was unable to be calibrated, suggesting that it is invalid in premise. A second set of experiments in a "hidden box" may be helpful, in the case that the experiment always gives random results. But what if they always give the same wrong results? The only valid experiment in this thread was the one which had a control -- the three container version. The three water levels did not line up, which means that we could not trust the alignment of either the front two or back two containers in that device. The third container acts as a necessary litmus test for the hypothesis. You should look into the subject of scientific integrity. In order for Newtonian mechanics to work the ad-hoc and unfalsifiable hypothesis of 85% of the universe consisting of invisible and undetectable matter has to be assumed. Such a theory is hardly worthy of any triumphalism. They need all sorts of shortcuts to make it work. For me, the most damning of the matter is that they cannot make a sun with a planet that has a moon. The available solutions to the Three Body Problem, beyond looking unlike anything seen in Heliocentric Theory, are so sensitive that the slightest change or imperfection will tear the entire system apart. 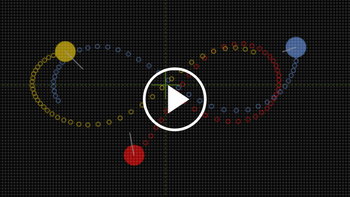 We can see the behavior of the systems in this Three Body Problem simulator that uses the simplest possible figure eight pattern, which requires three identical bodies of equal mass that move at very specific momentum and distance in relation to each other. So we can see how the ideas of being able to just use two body problems and the practice of considering the masses of some bodies as negligable or combined, or shortcuts of any kind, may be questionable. The configurations of the solutions need to be very precise.The slightest change in mass of one of the bodies in the above demo created an instable system that caused the system to tear apart. QED, I recall giving references to experimental evidence that a three body problem with a sun that that a planet that had a moon was not possible and did not exist in the n-body families. They all required at least two bodies of equal masses, and were in configurations that looked nothing like heliocentric orbits. You appeared to agree that there were no numerical solutions with such a configuration in the galleries or the studies and told me that we could cheat by treating it as a two body problem and considering the earth and moon as one, because that is what students do. If this were true and Newton's gravity worked based on approximations then we should expect to see those configurations in the three body problem galleries. It is my opinion that experimental evidence from Newtonian gravity simulators > "We can fudge a little" and "it's close enough". We should emperically favor experimental evidence over an idea of approximations. Regardless of whether the horizon is at eye level or not in all circumstances, the experiments used are not even methods that surveyors use. The people doing this experiment are basically just making up surveying science as they go along. The tool needs to be calibrated. The experiment needs a control. Assuming that it is level or that it is an accurate method is not enough.